Things happening as of late: I graduated! This fun and cheeky website I built, while building this other website with some awesome classmates. Interviews and more interviews. A Swedish midsummer's festival. My first Yankees game! A jazz show at Village Vanguard. So much grilling at the park. Dim sum with old friends. A breakfast sandwich crawl and fried chicken club hosted by the one and only, Donny. And of course the Saveur celebrations (where I got to meet so many amazing people: Sam, Cynthia, Renee, Brooke, Nik, Phi, Alana, Molly, Stephanie, Sherrie, Michelle, Elizabeth, Yossy, Sydney—Hi guys!). Things not happening as of late: Calling my family enough. Responding to emails (sorry everyone!). Spending time with Phillip. Taking O&O for their annual vet checkup (I promise, soon, dear kitties). Sleeping enough. Eating healthy. Riding my bike like I usually do during the summertime. Going to the beach. And most of all, this blog, or cooking at all for that matter. 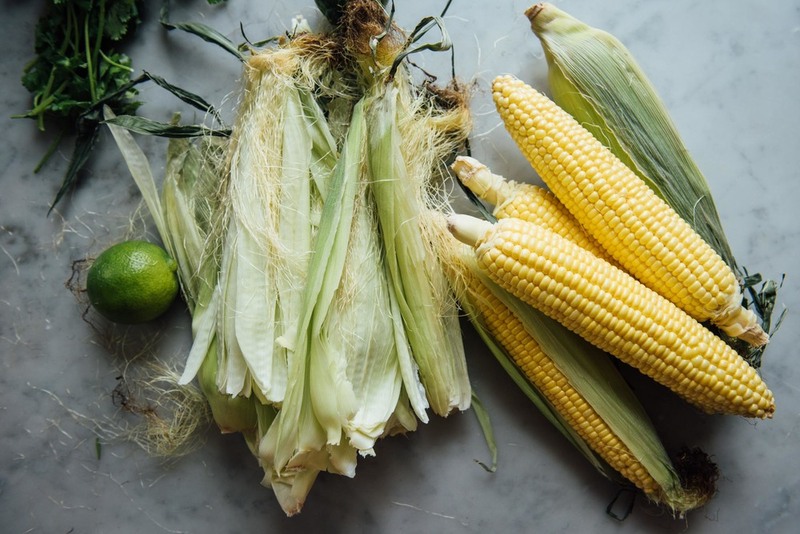 But since I graduated, hopefully that means I'll be able to devote more time to the laundry list of things above, so let's start with a post on what is probably my absolute favorite part of summer: sweet corn. Before we get any further, I must confess: even though I grew up in Texas, I've never actually been to Mexico. For shame, I know. And though I am not entirely sure of the authenticity of this corn, it's damn good, and really the only acceptable way to serve corn on the cob, especially during grilling season. Most recipes around the web for Mexican street corn call for mayonnaise as a main ingredient in the delicious sauce, but I thought it would do better with just a mix of Mexican crema and sour cream as the base to give it more tang and less...well, mayo. Add a liberal amount of lime juice, some ancho chile powder, garlic, and lots of cilantro, scallions, and cotija cheese and you have the best thing about summer sitting in front of you. Minus the whole having to get corn out of your teeth thing, but it's well worth that minor inconvenience. This recipe calls for oven roasting the corn simply because I don't have access to a grill most days, but you could also easily grill them for an even better result, or if you're feeling a little more refined, you can cut the kernels off the cob, cook them in a skillet and mix all the ingredients together for a "salad." Heat oven to 450 degrees F. Wrap corn cobs tightly in aluminium foil. Roast in oven, directly on the racks for 15 to 20 minutes until cooked through. Meanwhile, combine Mexican crema, sour cream, lime juice, ancho chile powder, minced garlic, and salt in a bowl. Whisk to combine. 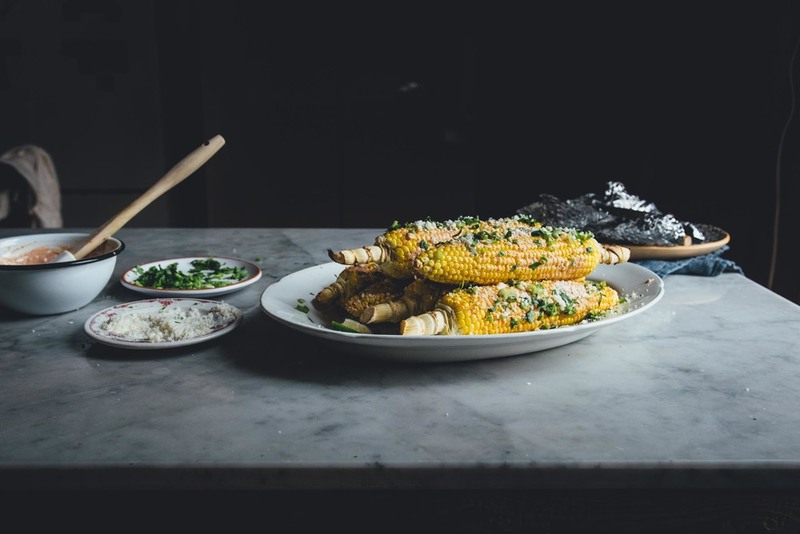 Once the corn comes out of the oven, unwrap them and immediately slather a tablespoon of sauce on each cob, then sprinkle some scallions, cilantro, and cotija all over. Serve with lime wedges and enjoy immediately.